Currently we are working on substituting sounds to make new words. I had some word family word wheels my mom had used back when she taught 1st grade. I liked the idea of them, but wanted to create a set that would work on substituting the beginning, middle, and ending sounds. This ideas turned into this new bundle of sound spinners! I made all of these sound spinners work the same way. Students simply spin the wheel to show a new sound, read the word, then lift the flap to see if the picture matches the word they read. Then students will spin a new sound to make a new word! I did leave the bottom spinner black & white to make these printer friendly! I send them home with parent volunteers to color them and put them together. 🙂 If you don’t send things home for volunteers to do, you are missing out!! At the beginning of the year I have parent sign up to volunteer in the classroom, volunteer to make copies/laminate, or volunteer to work not things at home (sorting, cutting, coloring, etc) It’s SO incredibly helpful!! The beginning and ending sound spinners have 4 words per wheel, while the middle sound spinners have 3-4 words. I do include instructions if you buy these, so you can see how easy it is to make these spinner! Each set of sound spinners comes with a worksheet for students to provide their answers. You can grab these sound spinners here! 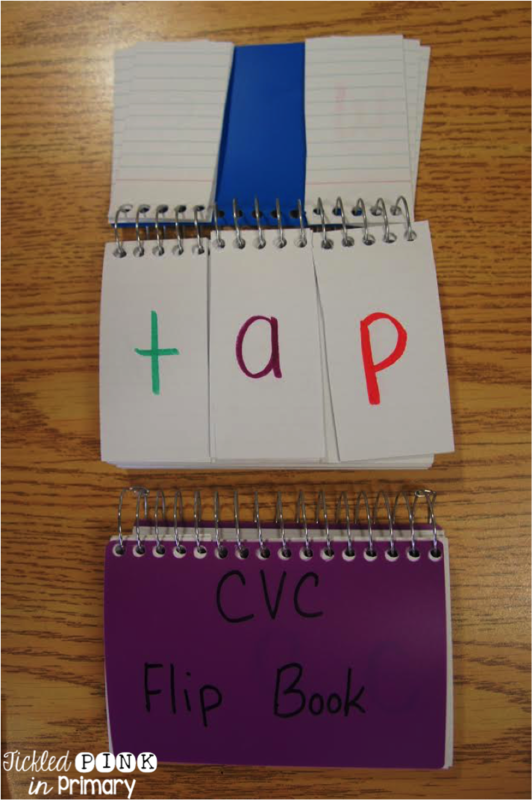 We also use our CVC flip books to practice switching sounds in words. I saw this idea on Pinterest and loved it! I divide a binder of notecards into 3 different sections. Next, add consonants to the 1st and last flap, and vowel sounds go in the middle. To make this more difficult, you could just do 2 flaps and do word families. Add blends/digraphs to the beginning or end for more added practice! To use these, students flip over 3 letters and read the word. I then tell them to switch the beginning, middle, or ending sound and make me a whole new word. This shows them how to make new words, but it shows me who can read simple words AND who knows what a beginning, middle, or ending sound is. Sometimes students have to find the word I tell them, put the word in a sentence, tell if it is real/nonsense, etc. These flip books can work on so many skills! Another way we work on substituting sounds to make new words is by using the game Lanolin’s Greenhouse on the Professor Garfield website. This whole section called “Orson’s Farm” works on a ton of phonics skills and the kids love it!